One of the things that is difficult to do in an online environment is to track student progress through a project. One idea is to use the Choice Module in Moodle. 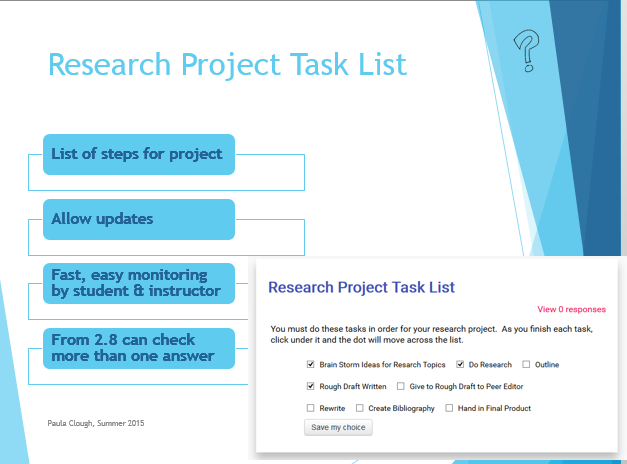 This ungraded activity can be set up with one question and multiple answers and allow students to update their choice answers as they move through the project or task. In older versions of Choice, only one answer can be chosen. They can move the selection across the steps, so the latest is the one marked. In newer versions of Moodle multiple answers can be chosen. This allows students to select all the steps they have already accomplished. Can’t edit your profile description ?